Storms take toll on Birling Gap Jump to media player Strong winds and torrential rain have led Wealden District Council to close access to the beach at Birling Gap, in East Sussex. 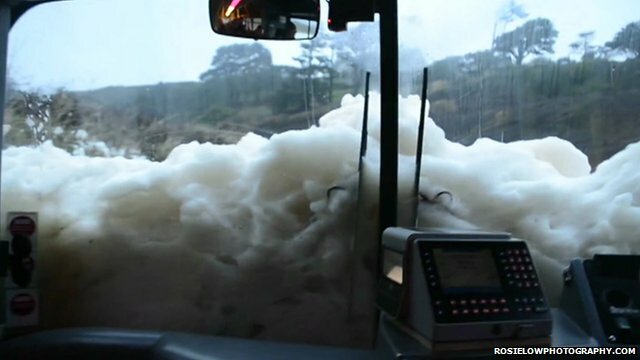 Ocean foam envelops bus after storm Jump to media player Foam whipped up by raging seas off Cornwall envelop Poldhu beach in Mullion and lead to an unusual experience for one bus carrying students. 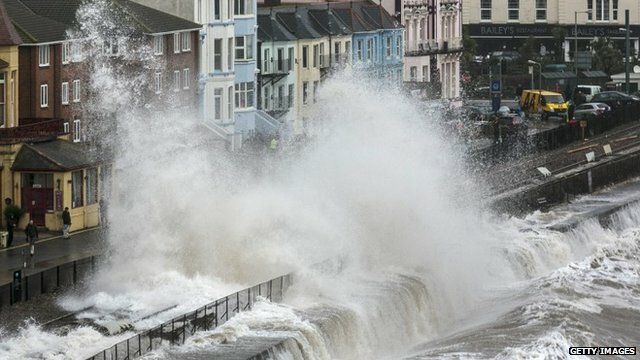 Scenes of raging seas in SW England Jump to media player Video filmed at the height the bad weather on Tuesday and Wednesday in SW England shows stormy seas, high winds and ocean foam hitting the coastline. 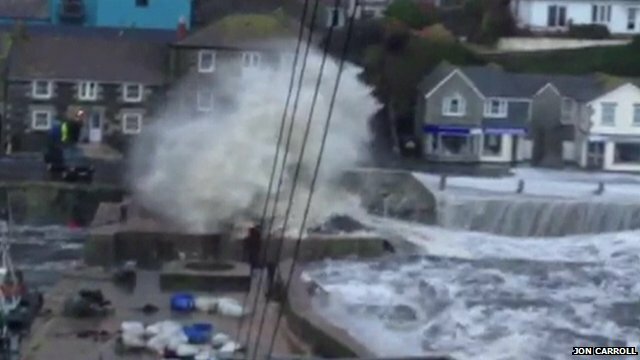 Boats filmed sinking in Cornish harbour Jump to media player Footage shows rough seas crashing over the harbour wall in Porthleven, Cornwall, causing boats to sink or be damaged. 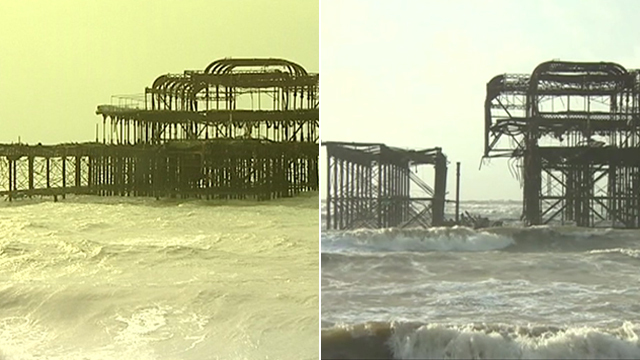 Brighton Pier before and after storm Jump to media player Footage shows how Brighton's West Pier looked in 2010 and after rough seas caused part of it to collapse into the sea in February 2014. 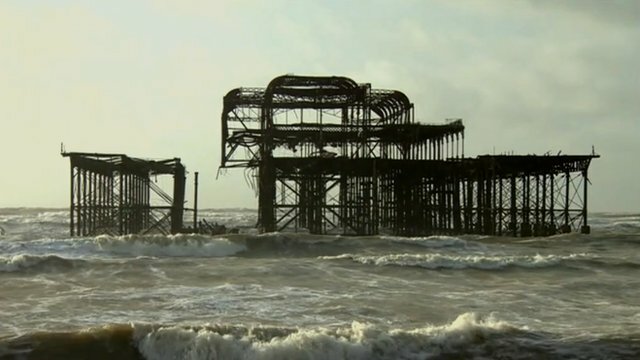 Brighton's West Pier splits in two Jump to media player Rough seas and strong winds have caused part of Brighton's ruined West Pier to collapse. 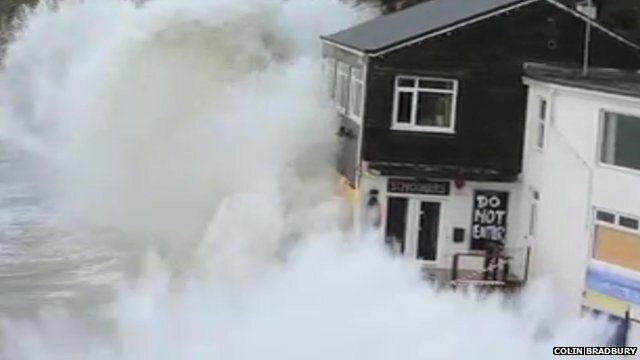 Giant wave crashes over restaurant Jump to media player Amateur footage has captured the moment a giant wave crashed over the Schooners Restaurant in St Agnes, Cornwall. Strong winds and torrential rain have led Wealden District Council to close access to the beach at Birling Gap, in East Sussex. 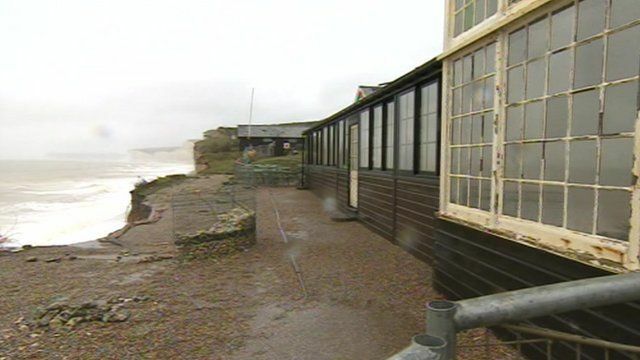 The cafe and shop above the beach remain open but there are signs that the cliffs have eroded in recent days. BBC South East Today's Sarah Cruddas visited the area and spoke to Graham Kean of Wealden District Council, and Geri Silverstone from the National Trust.